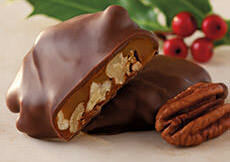 The ultimate confection for pecan-lovers! 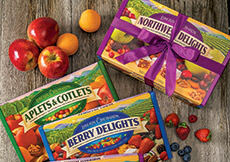 Each box arrives filled with pecan-packed flavors old and new! 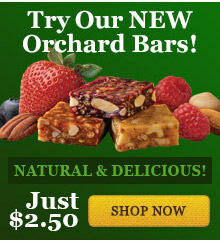 Enjoy Peach-Pecan, Spiced Apple-Pecan, Cherry-Pecan, Maple-Pecan, Caramel-Pecan, and Spiced Pecan flavors. INGREDIENTS: sugar, corn syrup, pecans, modified corn starch, fruit [fruit juice from concentrate (peach, apple, cherry), cherries, apples], pectin (pectin, disodium diphosphate, sodium polyphosphate, dextrose, dicalcium phosphate), natural flavors, sodium citrate, citric acid, malic acid. They have done it again....another great take on perfection. Love them all, but the all Pecsn definitely my new favorite. Happy Holidays All ! The maple and caramel flavors are awful. Beyond great,out of this world flavor. Delicious. Nothing else like it. You must try it! Can't Go Wrong With Pecans! I usually like to bake cakes with pecans instead of walnuts because they taste much better. This desert proves my point. 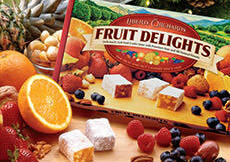 Such a great mix of fruits and pecans, I am hooked! I received Pecan Delights as a Christmas gift and they are great! I am so thankful you make such a delicious candy for those of us dairyfree-ers out here. Please keep these in your year round line. I came across these in a 4 variety pack from Costco and they became my immediate favorites! 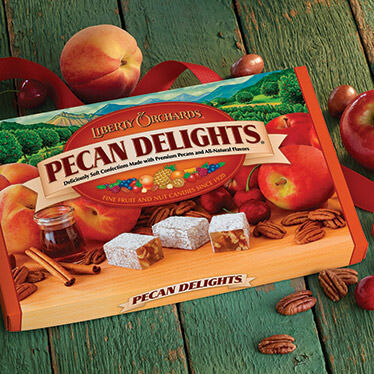 They taste like pecan pralines, I am so glad I found them on your website but hope they will be available all year and not just for the holidays! These are too good to exist in reality. They defy description in the tongues of men. I would push old ladies down stairs if they stood between me and this ambrosia of Elysium.